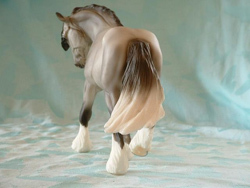 Breyer Christmas Horse Wintersong is a fine example of the special holiday horse models that Reeves International produces every year to celebrate the holiday season. Wintersong was made for the Christmas 2007 holiday season. 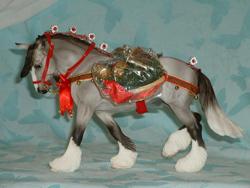 Many of the Holiday models are released with costumes. To the right is Wintersong with his red harness. However as with many of the models that are released with costumes, Winter Song has had his problems as well with the red staining from his harness. Personally I prefer him without the harness; he is fast becoming one of my favorite models to photograph and to set up because he has such wonderful movement in his feet and tail. 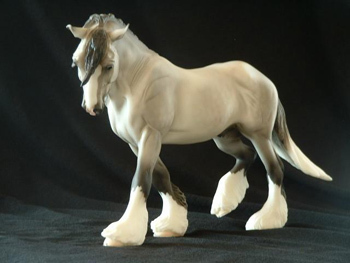 Wintersong was created from the Othello mold which was sculpted by Kathleen Moody. The original Othello mold was introduced in 2001 and made of porcelain in four different models. However Winter Song is done in the traditional plastic and I believe this is the first time the Othello mold has been done in plastic. If you like Wintersong, share him with others through a greeting card. The cards are blank inside so they are perfect for any occasion, and come in a package of 10.